Today I was honored to have my layout chosen as a Gallery Standout. This particular layout was created in tribute to Kim and my time at The Digichick. As many of you know, Kim, store owner and designer extraordinaire, passed away on July 11th. Keeping The Digichick up and running was determined to be too much for anyone else to handle. Kim had it down and managed it beautifully even in the midst of cancer treatments that would have taken most people out of the game. I was truly in awe at what she was able to do. Kim was one of my all-time favorite designers. Yesterday I was reading through her blog. She shared many of her struggles but all the while continued to provide freebies for her fans. If you haven’t read it you should. This is the layout chosen as a Gallery Standout. It tells how I felt as a customer in addition to being on the store CT. Many have expressed the same sentiments over the last couple of weeks. The Digichick was my favorite store. The Digichick designers are my favorites too and the challenges were always fun. I love a good challenge! I will truly miss everything about it and the people there. Today is the last day for purchases and the entire store is on sale. Don’t miss it! Shop here. 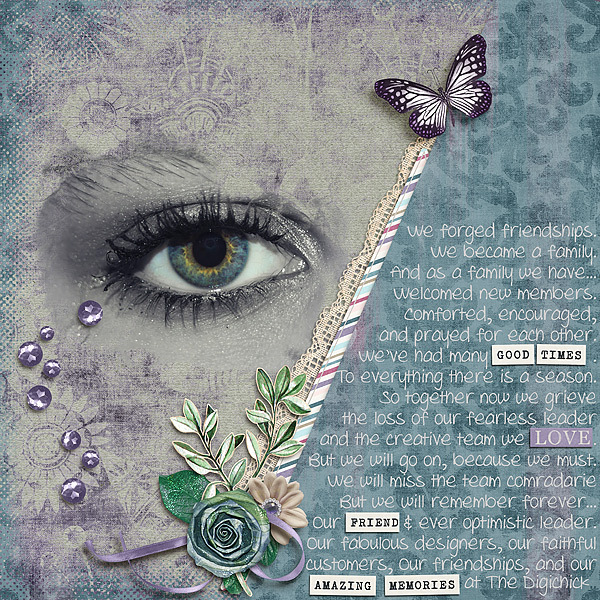 This entry was posted in The Digichick on July 31, 2018 by Yobeth.